Tariro means Hope and that’s what this is all about. There is little hope in Norton. There is even less when you start to talk to local families, especially the ones that come to the church that Victor and Deliwe Chirima pastor. There is a need to provide urgent support for these vulnerable people. And there is also a need to create an in-country sustainable income source. It is inevitable that once resources begin to come in to Tariro that many more people will come for help. There is therefore a need to produce significant benefit as there is much need. The heart of this partnership is to start a commercial vegetable production unit to generate resources that will make it possible to fund the existing beneficiaries and grow to help more people into the future. In addition to generating resources to help the poor, it will also create employment opportunities for people who have few options in a country that delivers little hope to it’s people. The church in Norton, led by Victor and Deliwe Chirima and their extended family, finds itself mired in a very difficult situation. They are being overwhelmed by the desperate needs of vulnerable people. To assist these people they have started the Tariro Support Group (ZIM01). Initially 200 people came for help, but when it was found that there was little money and only support and encouragement, most of them left. 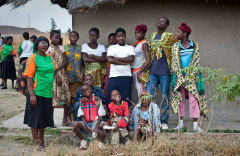 Now 25 adults and 20 children make up Tariro Support Group. Most of the adults are HIV+ and require ARVs and regular nutrition. Many of the children are undernourished and require significant nutritional assistance. The vulnerable have many needs, immediate, medium and long term needs. ZIM01 covers the short and medium term needs. This partnership will address the long term situation. The reason there is so much poverty in Norton now is that many farmers have been evicted from their farms since the redistribution of land that started in 1999. Most of these were white families who had been living in Zimbabwe for over 100 years. As they left the land, the local African people lost their opportunities for employment on the farms. Along with this, as the farms became less productive, the businesses in the city that serviced the farms came under pressure. So now, when you drive around Norton you will see huge granaries not being used, shop buildings that have been abandoned, an ostrich abattoir with cool stores sitting idle and a very dilapidated industrial area that once hummed with productive industry. Many of those to whom the farms were given had no farming experience or resources to invest in the farms so now there are hundreds of farms lying idle and few people with the resources to start them up again. Some of these farms are now being redistributed. The Gospel Assemblies are therefore able to obtain a farm for little or no cost. However, to get the land it requires that they are able to provide a guarantee that they have the personnel and the resources to make the farm productive. This was not required in the first redistribution! 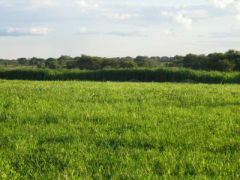 They are currently looking to obtain a piece of land, around 100 hectares, within reasonable proximity to Harare. This partnership is about developing a sustainable future for many, many people. The number will only be limited by the capacity of the operation to generate resources. They have a great leadership, clear structure and a vision for the long term. They want to help themselves, become self-sustainable and not reliant on outside help. The people leading this partnership have an ideal background that equips them to manage and oversee this type of operation in Zimbabwe. The key person is Elecson Chirima. He has a broad agricultural training base with great experience and management in both Zimbabwe and Zambia. He also has a long term Christian commitment and Christian ministry experience. He has a stable family and is highly spoken of by the leaders of the church community to which he belongs. Elecson will be ably supported by his wife and family, the leaders of The Gospel Assemblies in Zimbabwe and his extended family including his two brothers and their families. 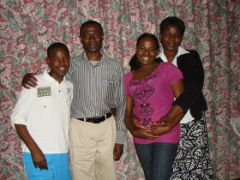 Elecson is currently living in Zambia but will shift back to Zimbabwe to oversee the farm. The vision here is to develop a commercial vegetable farm with the purpose of supporting an identified group of vulnerable children and widows. There are a number of foundational understandings built into this funding: that the land is granted gratis, that the business will be run efficiently and profitably, that there are no natural disasters in the first year, and that quality seeds and fertilizer is available when required.